I started looking for a compatible dog for my family of four children and I fell in love with the idea of the breed from what I had seen and read online – they sounded exactly like the type of dog I was interested in. 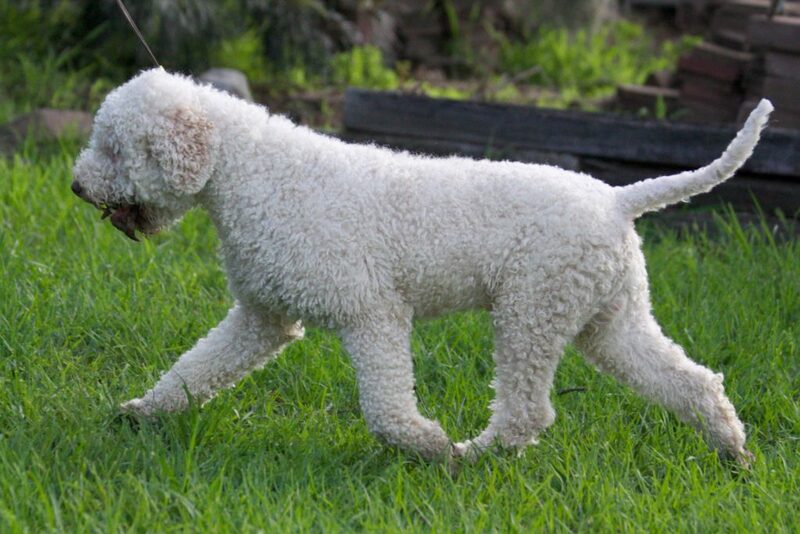 Curly fur, low-shedding, clever, affectionate, rustic presentation, medium sized, family oriented, and purebred! I went searching for some dogs to meet, and have been owned by them ever since. I have produced displays, set up and manned/dogged many information stands at the Sydney Pet Expo, the Sydney Royal, the Dog Lovers Show, local fun walks and pets in the park etc from back in 2008. 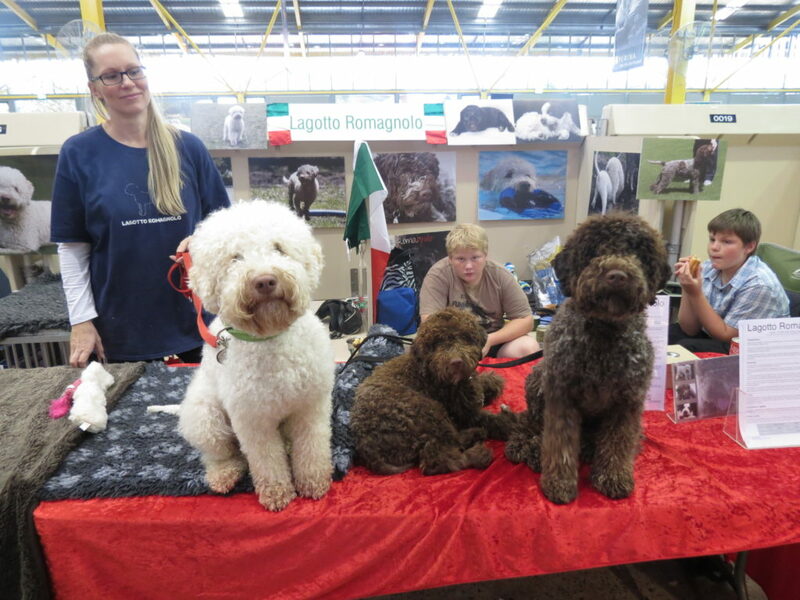 I’m one of the founding members of the Lagotto Romagnolo Club of NSW and have held different positions within the club. I’ve shown the dogs at exhibitions here and there and will continue to do so, but it certainly isn’t my passion, I gain far more pleasure from spending time with them at play and trying to capture their personalities and their joy with my camera. In 2012 I went to Italy to attend the Raduno in Bagnara, the largest breed speciality of the Lagotto Romagnolo, and the truffle hunting competition that is held the following day. Truly inspiring to see so many amazing dogs and the huge variance in how they were presented. So much passion in so many individuals about our breed. Health and temperament are paramount in my breeding philosophy. Health testing results can be found on the pages of each dog. 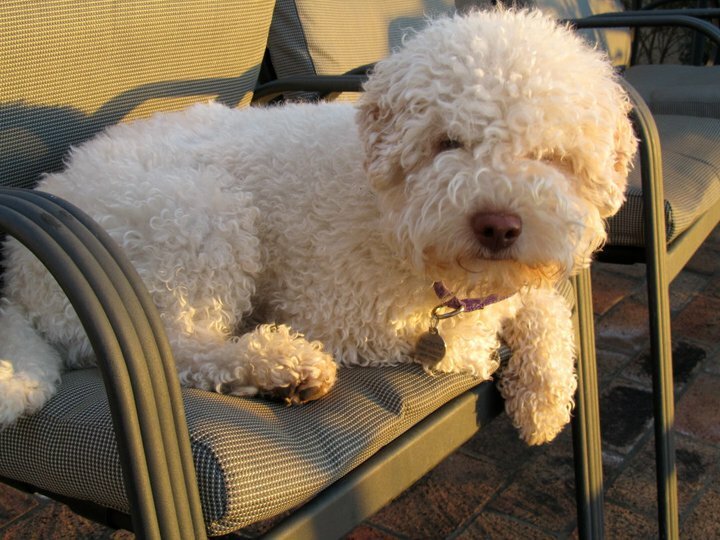 My first Lagotto was a beautiful brown female called Duoforza Lila. This was the start of a lovely relationship with her breeders, and also the start of my love of grooming. Lila and I did obedience together – her most outstanding attribute was her recall – she would come from miles to the sound of my voice. I found that she eventually bored of the obedience drills though and started staring off into the bush knowing that swimming in the river was coming next. She was great at tricks and did a fantastic ‘drop dead’ and could roll over and commando crawl brilliantly. She looked amazing dressed as a pizza box at an expo and wasn’t too bad in the show ring but I’m sure she would have been great given a better handler. My first attempt at training for ‘truffle hunting’ was with Lila using peanut butter, it worked very well as a substitute. Breeding her wasn’t meant to be for me sadly. Lila lives now with a beautiful family and another lagotto girl, both of whom are doted on completely. Next came Hesiodos Kiss Me Quick, “Pronto”. She was imported from Sweden and came to Australia at 12 weeks old, spent 30 days in quarantine then finally came home to me. A gorgeous, loving, determined, athletic, smart, sparkling white girl with a serious addiction to mixing dirt and water. My daughter and I tried showing her but, despite being beautifully put together she didn’t present well in the ring – she truly disliked it – so a title was not meant to be. Pronto was mainly a PR girl for the breed at expos and breed stands – a very gentle, kind dog with a real affinity toward children. She loved living on acreage with the horses, adored the chickens in completely the wrong way, and spent a lot of time constructing the most amazing tunnels through the gardens, sometimes with two openings. Climbing trees was a skill that she mastered too. One of her passions was hunting for truffle soaked rags – a game that we played regularly – she was amazing to watch, such a nose! Another passion was teaching other dogs, and her own puppies, how to dig, she would demonstrate, watch them as they starting digging, then bark at them if they stopped trying. Pronto enjoyed having two litters for Parity and was a most attentive and caring mother. In the A litter there were two boys, and in the B litter there were 2 boys/4 girls. She produced some stunning pups with lovely heads and beautiful, well set ears. She is retired and living a life of love and digging with my good friends and their other lagotto girls. My next import was in 2010, Nostryffelns Kasimiro, “Tino”, a white with orange male who also came from Sweden. His mother is Sanu’, an Italian girl with a wonderful temperament and a good nose for truffles and his father was Gillenias Leon, a stunning Swedish boy who won at the World Dog Show in 2008. He lived in Victoria for a time initially as he was co-owned, but came to live with me and the girls after a year or so. 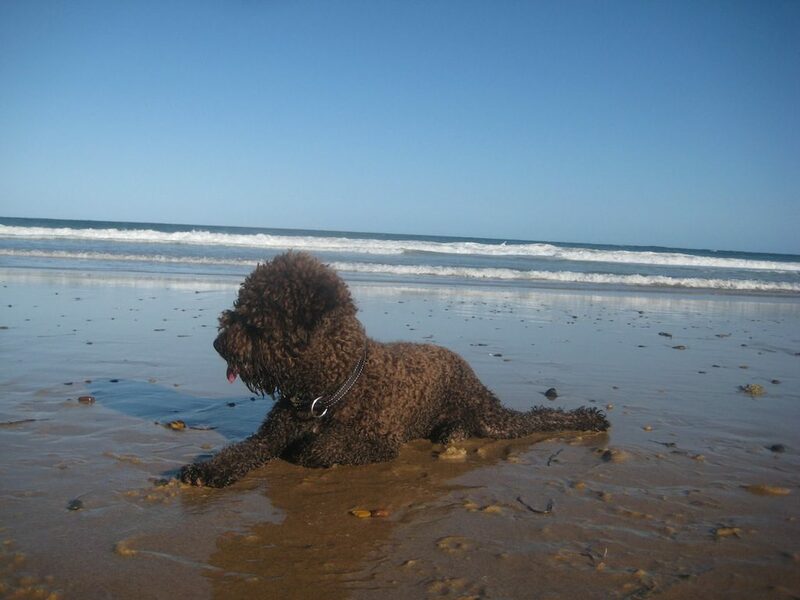 Tino is an extremely easy-going dog, not huge in the crazy energy department, quite sedate for a lagotto really – a very cuddly boy who likes lap time despite his size. He wasn’t shown very much, it seemed that every time he was entered into a conformation show we were unable to attend. As it turned out he was badly injured when he was hit by a car and was then unable to be shown at all. As testament to his beautiful nature, despite the pain he must have been in at the time, he allowed us all to help him and was even licking the vet as thanks. Before his accident he had sired pups in Victoria, one litter for my friends at Duoforza, and one for Parity. A total romantic and a gentleman, he would woo his ladies with kisses and cuddles and wanted to spend every moment with them. When Pippin from Duoforza was being driven away after her little holiday with us he was whimpering, and apparently so was she. Another dog who is very sorely missed by my family. Retired now, he lives with his new family who love him every bit as much. My lovely little roan girl with loads of attitude Nostryffelns Mozzafiata Mimi, “Mimi” came from the same kennel in Sweden as Tino from different, but equally wonderful, lines. She has always been very much the queen of the kennel and is a particularly active dog who loves retrieving from the water. She is not a dog that likes to dig or get dirty. 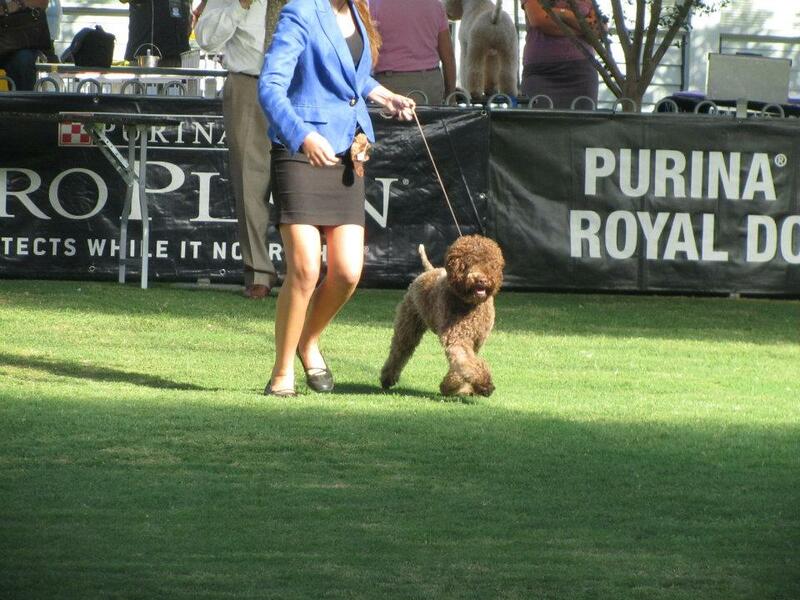 Mimi achieved her Australian Champion title and had some lovely moments during her show career. She is very much a thinking dog and seems to know what is happening next before I do. I’m sure she understands a lot of what is said as she makes appropriate noises to voice her happiness or displeasure about situations. She will stay by my side off-lead and race back if called, mostly I just point or look in a direction and she knows what I’m after from her. She adores having a job and at the command of ‘get the birds’ will chase away parrots that are settled in to steal fruit. She has been known to effectively hunt mice when they were a problem but is totally disinterested in chickens as prey. She can dive under the water to retrieve toys. The only time that she doesn’t do as she is asked is when she ‘knows’ I am thinking about grooming her. She will place herself out of reach under furniture and only grudgingly emerge amidst groans and sighs. It’s funny because she is the only lagotto I have ever had who does not appreciate grooming – my others (some of which are her children) jostle to be chosen to go up on the table. A beautiful mother, Mimi has had three litters for Parity, each to a different imported male. The C litter was to Tino and they produced 6 stunning babies, 3 boys/3 girls. The D litter was to Dante – also fantastic babies, 2 boys/4 girls. Then finally, her litter to Lampo, the I litter, was five puppies, 3 boys/2 girls.